Life at our pond is hotting up. We’ve noticed new signs of spring each week since our first trip. One of the most welcome is the temperature – so mild, we were actually able to sit on our blanket and quietly watch the pond for a while, which was heavenly! 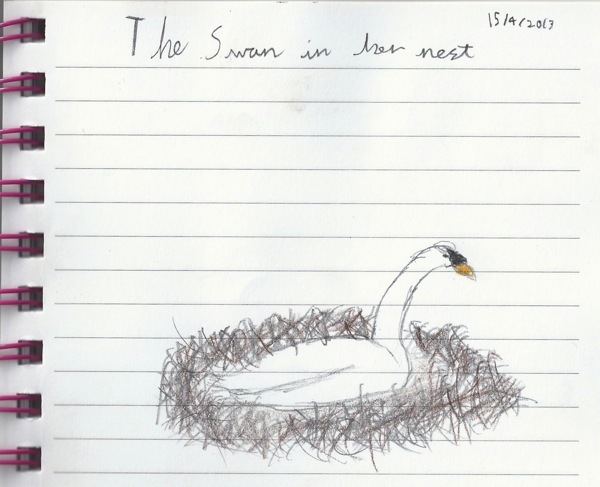 C(9) sketched the nesting swan in her nature journal while J(8) got busy with our new gadget, a digital aquarium thermometer. We saw a coot swoop low over the pond with a short willow branch in its beak. It landed near the base of a willow tree where we later spotted it on its nest. Some of the mallard ducks had found mates – we counted at least two pairs – but the male mallards still heavily outnumber the females. The males seemed to go round in gangs! 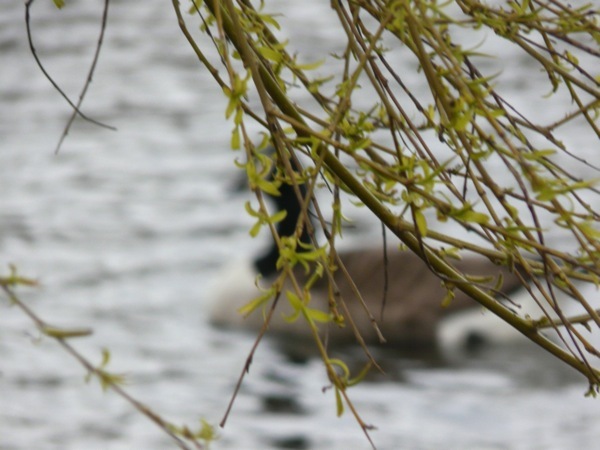 We’ve seen one pair of geese at our pond with very unusual markings. 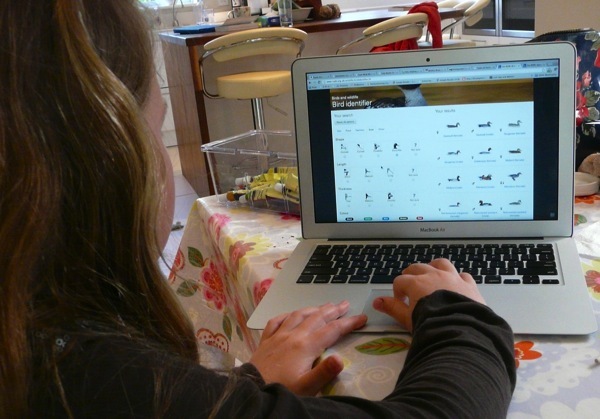 When we got home we used the excellent online RSPB bird identifier to work out that they are Egyptian Geese (how exotic!). Apparently these geese were introduced to ornamental ponds and have now begun to breed in the wild. 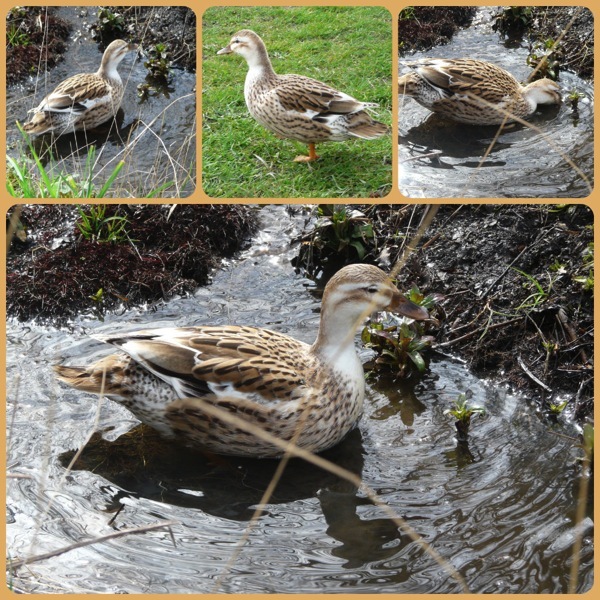 This very sweet little thing was dabbling around the “moat” by the island on its own. It was very tame, and quite talkative. The RSPB bird identifier wasn’t able to help us with this one. Our best guess is that it’s a juvenile of some sort. If you have any idea what it is, please do let me know! 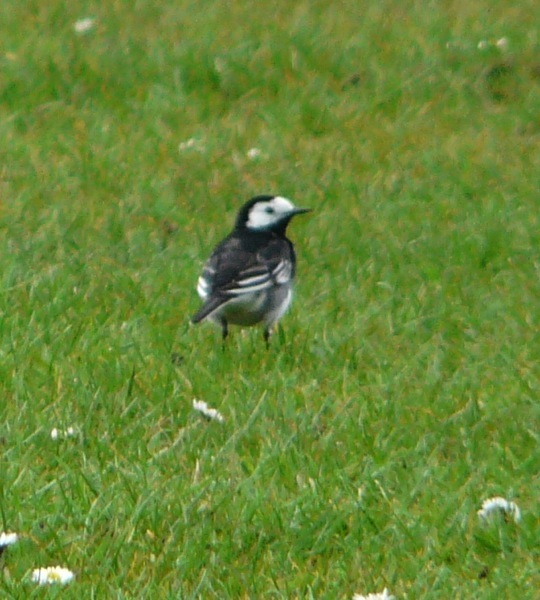 We also saw a pair of jackdaws and – far off in the distance – a pied wagtail (thank you, RSPB identifier!). 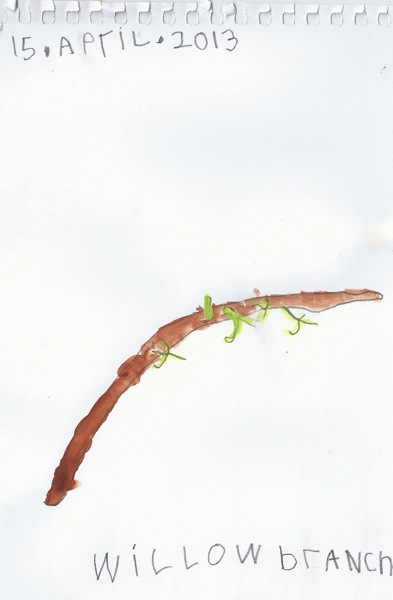 The willow tree that J(8) has chosen to study has begun to grow leaves. We brought a bit home to sketch. I love how when you draw something you see it in a totally new way. Mixing up watercolours helped us focus on the leaf colours, too. 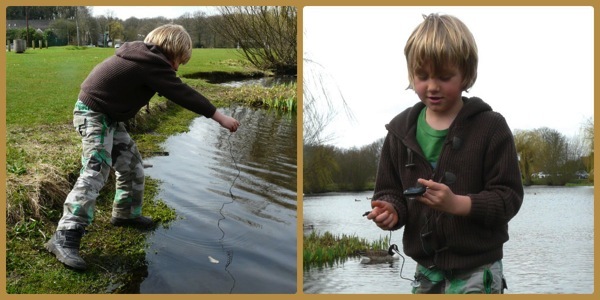 For more outdoor fun, visit Country Kids from Coombe Mill. Gary and I keep looking at your pond, convinced we’ve been there before!! 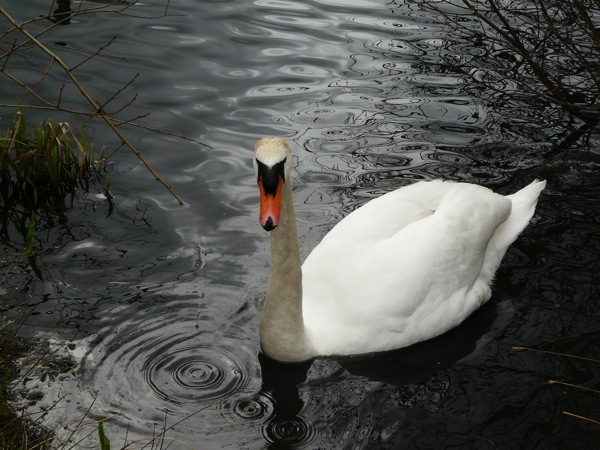 It’s a stunning pond, with such a variety of wildlife. 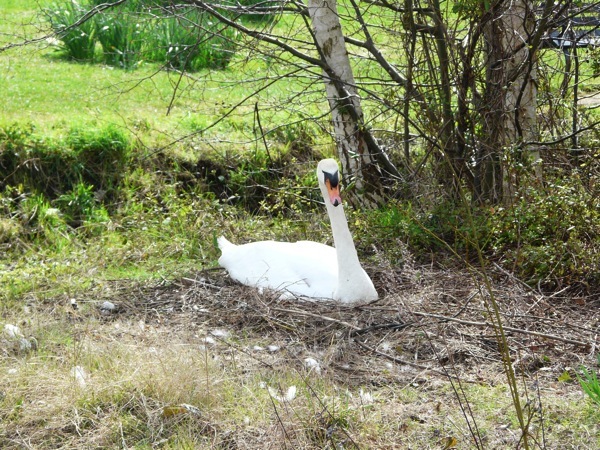 We occasionally get swans but they never stay longer than a month or so, simply because our pond is too small to support them. Lucky you- I think they would be one of my favourite birds. We’ll have to do a field trip to each other’s ponds at the end of the year!! Oh and all of you are very talented with your drawings/paintings, I particularly like yours. It’s very delicately done! I’m enjoying your pond study as well. It’s lovely just to be able to sit outside now that the weather is better and observe. Your activities are fantastic! Thanks, Hwee! Isn’t it such gorgeous weather this week? And we’re appreciating it so much after the late start to spring! 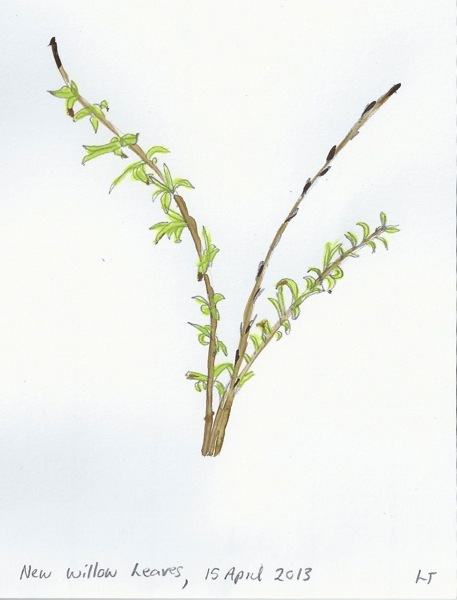 I was gonna say I love the swans, but I think the willow branch drawings might be my favorite, they’re so delicate. Thanks for stopping by my blog! 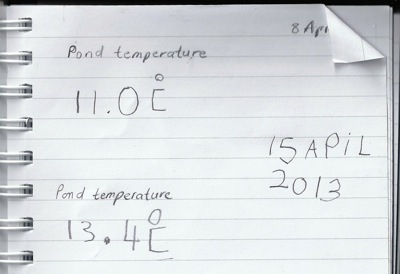 I love your Pond Unit Study…it’s so much fun learning alongside our children. 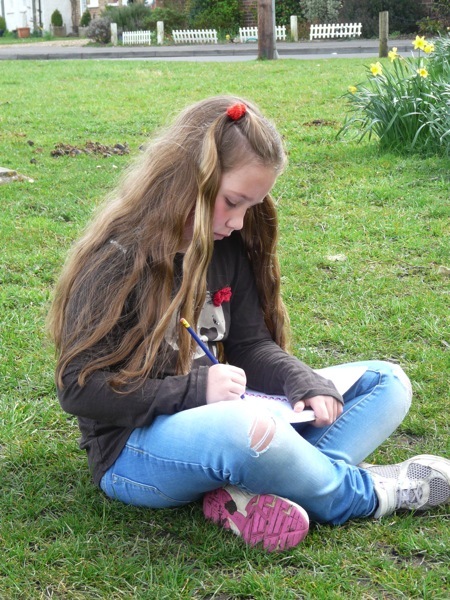 Hi Tara – I loved your rain cloud – so simple and effective. Yes you’re right, learning alongside the children is one of the huge bonuses of homeschooling, isn’t it? Someone is quite the artist there! I do love your hands on approach to learning. I have featured you on this week’s Country Kids post, dod pop over and have a look and please link up again. Oh wow, you are a homeschooler extraordinaire! I would love to homeschool my son but our circumstances don’t allow for it. I love the way they’re learning far more practically than the children in the school I teach in do. Beautiful watercolours! Seriously impressed with their drawing skills. Far better than I could manage. Some excellent learning ideas here too. Looks like a nice day out. 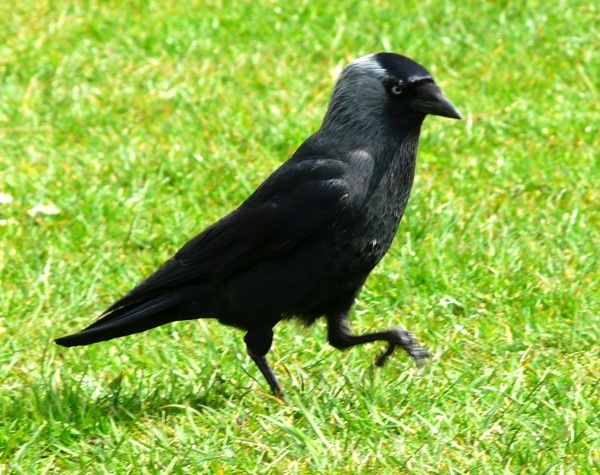 I love the Jackdaw picture. 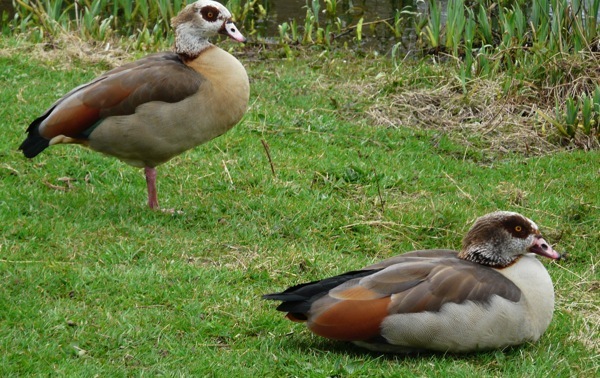 We also have Egyptian Geese near us in Germany. I was fascinated by them when we saw them for the first time two years ago and went home and identified them. 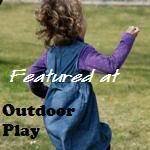 What a great outdoor activities for children, great way to learn! It definitely is! Thanks for stopping to comment, Greg! What a great environment for the kids. I have friends who bought land outside town, so their kids have their own catfish pond, barns, fields, trees. Enjoy it, most people don’t have these natural luxuries at their fingertips! Reminds me of when some random ducks decided to land on my small pond. Nice outdoor activity you got there for the kids!